At nine months old, my friend Sara Bhatia’s son Zander was sampling a variety of curries and other exotic dishes. My nine-month-old daughter, Ruth, on the other hand, was sampling the foods Gerber put in a jar. From Sara: When my husband and I began dating in the ‘80s, we decided to try to dine our way around the world. Even in relatively cosmopolitan Washington, D.C., this was a challenge – it took effort to find options beyond Chinese, Italian, Mexican, and Indian. There was a decent Brazilian restaurant, and a neighborhood where you could try Ethiopian food, but even sushi was relatively rare. Today, sushi is a staple at the grocery store, and my teenage sons think of Peruvian chicken, kabobs, and gyros as typical fast food. Dining out has changed, with transformations that reflect large scale trends of globalization and immigration. 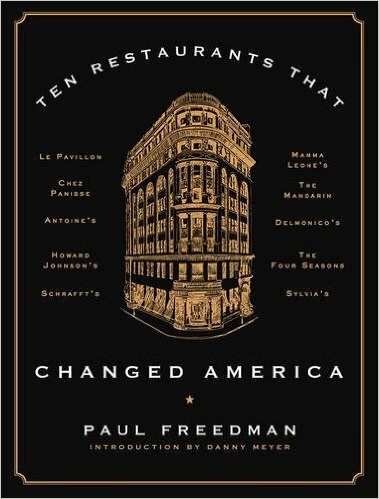 A terrific new book, Ten Restaurants that Changed America by Yale University historian Paul Freedman, explores these changes, using restaurants as a means to explore American social and cultural history, considering the role of gender, ethnicity, race, and class. Ten Restaurants is a delightful, big, fat brick of a book stuffed with quirky details, anecdotes, menus, and broad historical ideas. I devoured Ten Restaurants and read it front to back, but I suspect most readers would be content to nibble around the edges, flipping through chapters, enjoying the rich illustrations, photos, and reprinted menus, and making a satisfying meal out of a single chapter or two. Foodies and historians alike may quibble with Freedman’s list — there’s no steakhouse listed, or (astonishingly!) fast food. Sylvia’s, the legendary soul food restaurant in Harlem, serves double duty, representing both African American and Southern cuisine. With the exception of Antoine’s (in New Orleans) and Howard Johnson’s (on highways across America – part of the post-war suburban sprawl), Freedman’s profiled restaurants were all in New York City and San Francisco. Freedman defends his bicoastal focus, arguing that for most of American history, New York and San Francisco set the bar for culinary excellence, and were true trendsetters influencing how and what Americans ate. For me, the larger concern is that Freedman often confounds cause and effect. Many of the restaurants seem less an agent for changing America than a reflection of larger socio-economic shifts. For instance, Schrafft’s (a chain of middle class restaurants founded in NYC in the early 20th century) provided affordable but gracious lunchtime dining that catered to the emerging class of working women and department store shoppers. But suggesting Schrafft’s changed America seems off the mark. Rather, I’d argue that Schrafft’s benefitted from the larger scale socio-economic changes, and its success led to imitators and changes in the ways Americans dine out. · Delmonico’s (no relation to the contemporary steakhouse) defined fine dining in the 19th century with French high cuisine, adapted to American ingredients. The restaurant offered belt popping 14-course meals, with many dishes utterly unfamiliar to 21st century diners. Two of three of Delmonico’s famed specialties hailed from the Chesapeake Bay. Despite living less than an hour from the Bay, I have never eaten – nor ever heard of anyone eating– either canvasback duck or terrapin. In 19th century America, they (along with massive Hudson Bay oysters) were the height of gastronomic elegance. Honestly, there’s almost nothing on Delmonico’s menu that I would choose to eat today. · Prohibition was disastrous for both high end (overwhelmingly French) restaurants, which relied heavily on fine wines, and lowbrow workingmen’s pubs, which served food as an afterthought. The decline of both high and low-end dining establishments in the 1920s paved the way for the emergence of a wholly new kind of restaurant – wholesome, alcohol free, and designed for women, families and the middle class. · Le Pavillon, the quintessentially French and most prestigious restaurant in mid-century America, was first founded as the actual French pavilion at the 1930-’40 New York World’s Fair. By the time the fair closed, the Nazis had invaded France, and management moved the restaurant to midtown Manhattan, where it flourished. · Cecilia Chiang, the founder of the upscale Chinese restaurant The Mandarin, was a refugee of the Communist Revolution in China. Madame Chiang introduced traditional Chinese cooking techniques and ingredients to America, creating an alternative to ubiquitous cheap, Americanized “chop suey houses,” and instructing many of her generation’s finest chefs in Chinese techniques, including James Beard and Julia Child. PF Chang’s – the greasy, pervasive Chinese food chain commonly anchoring suburban shopping malls – was founded by her son, Paul Chang (note his Americanized spelling). · The oh so chic Four Seasons was such an “it” spot in 1960s New York City that Coca-Cola chose it to launch Fresca. The restaurant covered its in-restaurant marble pool with a sheet of ice and hired models to serve the soda to enthralled guests. Freedman’s book explores not merely what Americans ate, but the cultural context of dining out. He argues that restaurants can teach us about more than just food, but also how we think about dining out, and with whom. Atmosphere, social groupings, class and status are all explored as Freedman considers the emergence of feminine dining spaces (and later ladies who lunch), the rise of restaurants as a locale for live entertainment and spectacle, power lunching, the explosion of ethnic foods, and the emergence of a distinctly American cuisine. 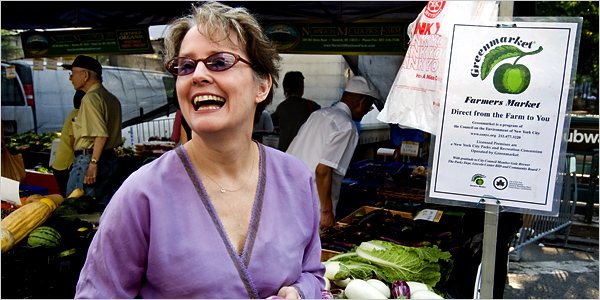 In his final, aptly named chapter, “The Way We Eat Now,” Freedman considers Alice Waters, the much-lauded founder of Berkeley-based Chez Panisse. Over the past four decades, Waters has utterly transformed the dining landscape, spearheading the rise of California (sometimes called New American) cuisine. Waters’ commitment to fresh, seasonal, locally sourced food is so inherent to how many Americans now strive to eat that it’s easy to forget how radical a notion it once was. For most of the twentieth century, fine dining implied that you weren’t tied to the seasons or local ingredients. A fancy restaurant – almost by definition – imported rare and foreign ingredients, often out of season. Eating peaches in winter, French foie gras, or imported truffles was a sign of prestige. Alice Waters completely flipped the equation. The way we eat today, Freedman argues, represents a triumph of Waters’ commitment to farm-to-table cuisine, with its emphasis on local, seasonal ingredients with a connection to the historical or artisanal past. He notes other trends, such as interest in molecular and modernist gastronomy, the emergence of celebrity chefs, the influence of Asia and other immigrant and ethnic cuisines, and a rise in informality in the dining experience. Freedman’s book offers a fascinating and delectable journey for readers interested not only in food, but in American social and cultural history. Dig in. · Chef’s Table – A Netflix original series. 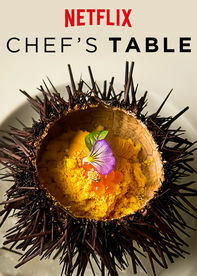 Each episode focuses on a visionary chef with a restaurant listed on the San Pellegrino Top 50 Restaurants of the World. My teenagers loved this series. Our favorite chef – Magnus Nilsson, uses ancient techniques and foraging to cook seasonally throughout the long winter in a tiny restaurant in northern Sweden, near the Arctic circle. · Deli Man (2014) – funny documentary examining delicatessens throughout America. For the record: Zander might have been a little older than nine months when curries were introduced. I loved this post! Perfect blend of criticism, appreciation, and inspiration. Delightful review: sharp, engaging, and fun. I would not have thought a book review about some restaurants (let alone the book itself) would have been all that interesting. I was wrong. Bon appetit! Great review!! I didn’t want it to end—headed to get the book today!!! Enjoyed your review Sara! Sounds like an interesting book, I’ll put it on my list. Also, enjoyed seeing the recent photos of you and your boys. Hope to read more of your reviews. Excellent review, Sara! Also thanks for the bonus list of films!